The Wicked GT 2017: Just 10 days away! Army lists due this Friday! A quick update for everybody! Just 10 days away from the 3rd Annual Wicked GT! It’s going to be great! As expected, we’ve had a few guys have real life issues come up and we’ve fluctuated with the amount of overall generals that are signed up and going to attend… so as of right now, we have 23 total generals ready to do battle and even have a ringer on hand in case we end up with an odd number. So keep spreading the word! Let’s make this Wicked GT the best one ever! Army Lists due this Friday! May 12: Finalize your lists and get them in as soon as possible! Don’t forget that they need to be in a legible format such Army Builder, Excel, or even Word. No handwritten lists, please! Players Packet! The Wicked GT Players Packet has been updated and is now available for your viewing pleasure. If you’d like to download a copy then please click this link! Enjoy! The Wicked GT 2017: 2 weeks away! Army lists due in a week! As of today we are exactly 2 weeks away from the 3rd annual Wicked GT! The venue has been booked, terrain is being made, sponsors are being lined up, trophies are done, and we are getting our hands on more and more stuff to hand out every single day! The Wicked GT Bar is going to be fully stocked and we’re working on getting some custom items made so that you can walk away with unique swag that you can only get here! A few items that we wanted to bring to everybody’s attention as we get closer and closer to the big day. Read on! We currently have 22 generals signed up and ready to do battle!! So if you know anybody that’s interested in playing in the best Wicked GT yet then have them email us and we’ll get you signed up! Let’s shoot for 30 people!! Make your payments! We need the money now so that we can finish paying what needs to be paid! Army Lists due next Friday! May 12: This date is when your army lists are due! Get your practice games in and finalize your list and then get it sent in so that it can be reviewed. Please no handwritten lists! Needs to be in some form of readable format (Army Builder, Excel, etc). Any lists that are submitted later than May 12 are subject to points deductions. The Wicked GT 2017: Scenarios #3, #4, and #5 now available! A quick note to let everybody know that Scenarios #3, #4, and #5 are now available!!! You can check them out by clicking the following links! Scenario #3 – The Path is Revealed! Scenario #4 – The Will to Survive! Scenario #5 – There’s No Place Like Home! Scenario #1 – Welcome to Oz! Scenario #2 – Finding Your Way! We currently have 25 generals signed up and ready to do battle!! So if you know anybody that’s interested in playing in the best Wicked GT yet then have them email us and we’ll get you signed up! Let’s shoot for 30 people!! Just 2 days remaining to make your payments!! If you wait past April 21st, the price goes up!! April 21: This date is important for 2 reasons. 1st – This is the last day for refunds. If you have something that comes up between now and April 21 that prevents you from making it to the tournament, and you’ve already paid, then we’ll gladly refund you. However, if it’s past April 21 then the money has already been put to use for things like securing the venue, deposits, etc. Please let us know prior to this date if something comes up and you can’t make it. 2nd – This is also the date that the price goes up from $50 to $55 so make sure to pay prior to this date to get the $50 price! After April 21, the price goes up $5. Scenarios #1 and #2 now available! A quick note to let everybody know that Scenarios #1 and #2 are now available!!! You can check them out by clicking the following links! Players Packet now available and some important dates are fast approaching! We are about a month and a half from the 3rd annual Wicked GT and this year we’re looking to break attendance records. Already just a month and a half into registration and we have 20 generals signed up and ready to do battle. We have some new faces that have signed up and still waiting to hear from some familiar ones so we should push at least 30 players for this event… Trust me, you’re going to want to be a part of it! If you know of anybody that would like to participate in the 3rd annual Wicked GT, then have them email thewickedgt@gmail.com and get registered! Our venue can hold up to 44 players so let’s push that! Spread the word! Scenarios! The Wicked GT Scenarios will be released next week! So stay tuned for the next update and you’ll be able to see all of the scenarios! The Wicked GT 2017 Registration is now open!! The 3rd Annual Wicked GT 2017 Registration is now open!! If you’re interested in signing up and being apart of one of the best GTs in the Central USA then make sure that you make it out! The Wicked GT will be even bigger and better this year and we are looking to break attendance records! If you’d like to sign up then simply send an email to thewickedgt@gmail.com with your name, club (if any), and army (if you know) and we’ll get you signed up. This year the cost will be $50 each player and you can PayPal to the same email address, thewickedgt@gmail.com. Let’s get a great turnout this year and follow off of the success that was the Red River Rumble GT that just took place this past weekend. We had 20 generals there and will look to get even more for the 3rd annual Wicked GT! See you there!! The Wicked GT 2016: Player / Army Breakdown! 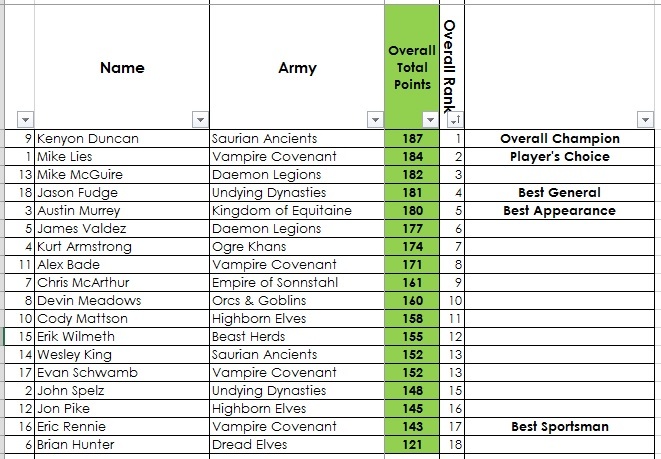 Now that the Final Results have been posted for the Wicked GT 2016 I wanted to take a second to show everybody the breakdown of the armies that were present throughout the weekend. It’s fun to look at the overall data to see how armies are performing across national GTs and to see what armies are most and least popular. So here’s a quick breakdown of all that was at the Wicked GT! !